Previously the Equine Influenza Surveillance Scheme has tested nasopharyngeal swabs and paired blood samples from suspected cases of equine influenza free of charge in our diagnostic laboratories, funded by the HBLB. However, to continue to qualify for a free testing, a current submission form must be completed. 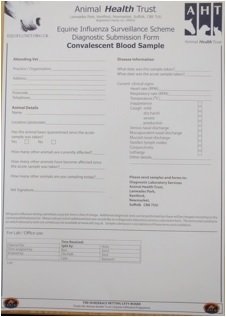 This is included with the sampling kits the Equine Influenza Surveillance Scheme send out. Please ensure you are using the current form, which provides more detail about clinical signs and environment. Without this form you will be charged for testing. The scheme has reported that many more blood samples were received during 2015 than in previous years, however the majority were single acute samples. For a successful diagnosis of influenza infection, paired samples are necessary to compare antibody titres in acute and convalescent sera and therefore he scheme will only be able to run the free serology test once the second sample has been received.